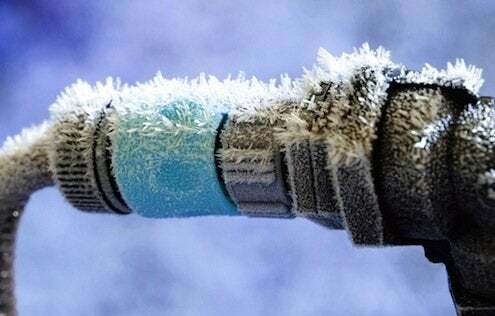 ‘Tis the season for freezing pipes, and that’s not just for folks in colder climates. In warmer states, where plumbing is often run outside the home’s conditioned spaced, cold snaps have been known to catch folks off-guard and cause widespread pipe-bursting headaches. Be sure to thoroughly insulate any exposed pipes in your attic, basement, or outside. Electrical heating wraps aren’t ideal and can even be dangerous, so it’s best just to seal off all gaps that might let cold into your house and cause pipes to freeze. Because it’s the pressure of the faucet that causes pipes to burst, leave a faucet dripping a little overnight as a safety precaution if you’re worried about a freeze. If you’re going to be away from home a while during cold weather, it’s a great idea to drain the pipes altogether. Turn off the main water valve where it enters your house, then run all the faucets dry and don’t forget to flush the toilets. You don’t have to worry about water mishaps, and you can leave the thermostat turned down low so at least your energy bill will be lower after the holidays.